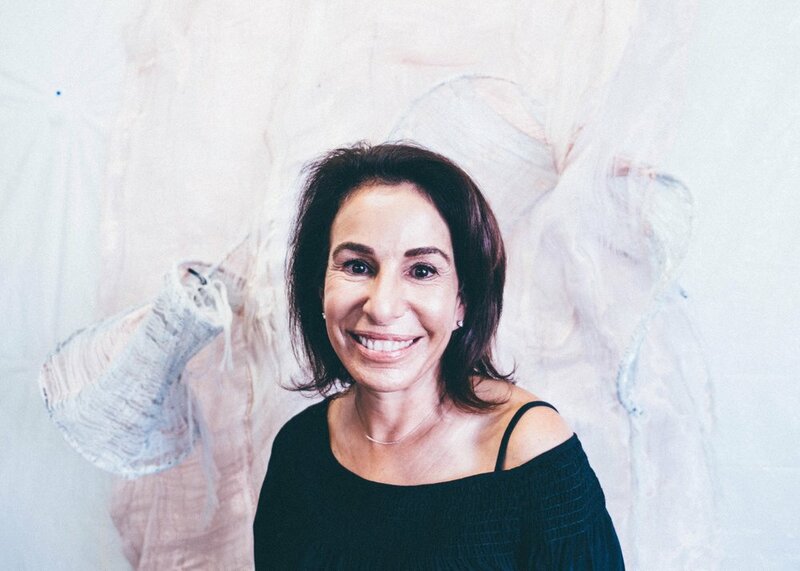 Textile and sculptural artist Elise Vazelakis’s spunky spirit & charisma make this artist’s work larger than life & inspire women of all ages that they really can have it all. Elise’s works border the line between rigidity and loose construction. She uses a loom to weave her works that gives her consistency and a sense of space, while using unconventional materials such as wire to break up the strict lines that come with weaving. The wire allows for her works to move, breathe and flow with her manipulation of her hands to give it a look of dancing materials on a wall. We had the pleasure to tour Elise’s studio, which she shares with artist + mentor Tom Wudl and other fellow artists. Elise’s joy and enthusiasm for life left us feeling that we are pretty sure we would gladly take her as a mentor any day. Her drive to continually create, learn and grow as an artist, no matter the circumstances, inspired us. Elise came to Tom’s studio over ten years ago at a point when she wanted to expand her career beyond just figurative drawings. She knew she needed guidance and someone to help her get over that block. Tom helped her work step into a more contemporary realm by pushing the status quo and creating beyond what is just seen. For Elise creating her two-dimensional sculptures came so natural once she was able to see the potentials that lie inside of her. Elise explained how Tom reads books to her (and the other artists in the studio) every week about other artists. She mentions that currently, he was reading out of a book about Joseph Cornell. It was in those weekly readings she became inspired by a female artist, Eva Hesse, that she describes as her, "total inspiration." "I took all these classes: sculpting, painting, and self-educated. I was always going to museum and taking the kids to museums and galleries." Elise, with a smile, brushes off this blow to her dream. She ended up earning a marketing degree and worked in the corporate world for a while. When she turned twenty-one she moved to Los Angeles. There she worked for Westfield where, by chance, she met her husband. In the end, her parents' push for her to pursue a career in business helped her to build a ‘go getter’ mentality that she could apply to the art world. Elise and her husband are parents to her twin daughters and two sons. Her ability to keep up with the demands of a family and work life never trumped her passion for pursuing her art. After sacrificing her art to pursue business she was finally able to do the one thing she loved the most. This decision leads Elise twenty years ago on her journey of her finding her artistic voice. She started to take art classes religiously, learning all she could about drawing, painting, etc. She never received a formal art education but knew that she possessed a love for art and her tenacity has led her to success. Elise incorporated her love of art and creativity in her parenting. Her outlet and passion were channeled into her passion for art, which evolved over the years. Elise showed us some of her current projects as she uses thread, copper wire, and fabric through a loom to create sculptural masses. With these large pieces she is now able to bend and shift the panels with the wire weaved throughout to help create the desired motion. She describes how every day she is diligent to create just one thing, whether in her sketchbook or in her studio at her house or in the Tom’s artist collective studio. In her sketches many times she will sketch out multiple studies of a project before creating it. Now that Elise is familiar with the loom + materials and comfortable with its limitations she feels safe to experiment more. Recently she has been adding some tubing and playing with adding other elements into her pieces. Elise’s process is very childlike, in that she allows herself to get immersed in her play-like art posture. Her no pressure or guilt mentality allows her practice to remain a life long passion and pursuit. She recounts the other day in the studio she spent two hours trying different colors in her hand weaving only to completely get rid of it. She was unhappy with her results and consequently took apart all of her hard work. She lets the seriousness of her work not over take the process and allow the materials speak for themselves. Elise describes it as an interesting story when in 2008 she and her family relocated for her husband’s job in Dubai. It was when the economy was struggling. At the time she was 52 and her kids were 16 and 17 years old. It seemed like an odd time to start a new life in a different county, not the least relocating to the Middle East, but it ended up being an important time for Elise creatively. It was during her time there she became obsessed with the headdresses she saw the immigrant workers wearing called gamchas. The gamchas were brightly colored and patterned headscarves. Out of her weaving she created the Gamcha project. The Gamcha project started with her trading with the immigrants little packages of goodies with cash in exchange for their gamcha. Soon she became known as the crazy gamcha lady and well known/loved in the community. It wasn’t until she came back to visit Los Angeles that she was able to get her hands on a loom and she learned from a Japanese lady who taught her weaving lessons. She took her loom with her on a plane back to Dubai and started weaving photos and the gamchas together. It became a personal project and eventually word got out. Eventually Elise’s husband got transferred back to America but Elise was still enchanted with her weaving. Once he was home she continued to experiment with her weaving and using unconventional materials like copper wire. As a kid, Elise’s first memories with art were associated with sewing and her grandmother. Her fascination with weaving brought her back to her roots with her Grandmother’s sewing. Connections within her art can be seen with her use of negative space, movement and color. Parts of her pieces will have gaping holes, or moments of triumphant linear movement that all speak to Elise’s commentary on her life. She recounts struggles in her own life with losing her mother at a young age and recently losing her second mom from her dad’s second marriage. While also dealing with her own struggles with Rheumatoid Arthritis that has created pains in her art practice which is dominantly dependant on the use of her hands. This has allowed Elise to be able to look empathetically at her own life and artwork. She does not make excuses but has pressed forward and continued on with her passion. Elise, at 59, keeps a youthful attitude by reinventing herself and keeping her passion alive. Wether it is her latest artwork or a bird nesting in her yard, finding happiness in the small things is the key to feeling youthful. From her career in marketing, to starting her own PR firm, to being the matriarch of her family and now establishing herself as an artist, her life can be compared to a cat with nine lives. She nonchalantly but confidently insists how she continues to reinvent herself by continuing to learn and do new things. Elise shares her wisdom of finding a way to be able make money and support yourself while still being able to fuel that creative edge. She shares how in her own daily routine she will quickly finish her house chores, take care of the kids and family just so she can tuck away and work on her art. It is her passion and excitement for her art that has allowed her after all these years to return to that love. Elise describes the process it took from seeing herself as a businesswoman then mom and now artist. It really, as she describes it, is interconnected. She is all of them. It was during her time in Dubai that she would say she made the transition into finding her voice as an artist. For the first time she was given a platform and a purpose behind her art. In our field trip we were entranced by the truly magical and creative space that surrounded Elise, not just because of her body of works but also because of her presence and story that captured us. Her artwork we love because we see the interworking loops of your life through your looms and how it affects those around you whether here in LA or Dubai.